Kona coffee farmers can claim a small victory this week, as the Safeway grocery chain has agreed to modify the labels on its ‘Safeway Select Kona Blend’ coffee packages. In a letter dated Aug. 31, Susan Houghton, Safeway’s director of public affairs and government relations, said the company has directed its advertising agencies to make changes to the labeling. “… Safeway is not violating any law since this product is only sold outside of Hawaii. This important fact notwithstanding, we recognize the importance and significance of this issue to your members. Likewise, Safeway seeks to support the communities in which we live and do business. * The Kona blend packaging will be further modified to indicate the geographical locations of other beans used in the blend. This new packaging will coincide with the implementation of Hawaii statue 486-120.6, effective July 2012. Houghton also said select Safeway stores in California will begin carrying Royal Kona Coffee with 100% Kona coffee in April 2012. 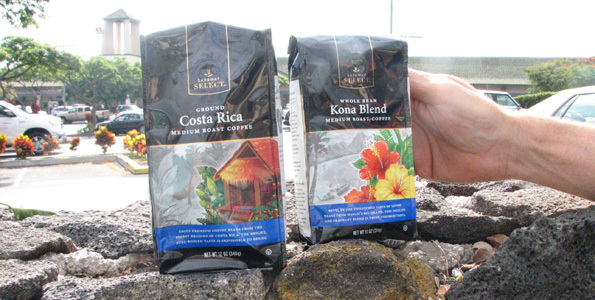 KCFA had demanded Safeway make the changes to the Kona blend packaging after board member Paul Uster spotted the product on Safeway shelves in mainland stores. The Kona blend medium roast coffee labeling does not specify what percentage is Kona coffee or whether it was grown in Hawaii. It does indicate it has ‘savory beans from Hawaii’s Big Island’ and does specify it contains ‘100% Arabica coffee.’ Kona coffee is Arabica. KCFA enlisted state Department of Agriculture chairman Russell Kokubun assistance and he wrote to Safeway in April, urging the corporation to voluntarily comply with Hawaii state law, which mandates labels on Hawaii-grown coffee inform consumers of the percentage. Kokubun said he also was pleased Safeway will begin selling 100% Kona coffee at its California stores. “Just making the product available to their customers out of state is a huge plus,” he said. KCFA president Colehour Bondera said he was ‘pleasantly surprised’ by the letter, but regretted that the grocery giant, which is based in California, had been so slow to respond. KCFA called for a nationwide boycott of Safeway stores and staged a protest Aug. 11 outside the Kona store. In his reply to Houghton, Bondera asked when the packaging will be modified and whether the state DOA and KCFA will have an opportunity to review and provide input for the new labeling. He also said he wants to know what percentage of Kona coffee is in packages of Safeway Select Kona Blend that are currently on store shelves. Bruce Corker, chairman of the KCFA Legislative Committee, said he is encouraged by Safeway’s relabeling pledge. In an unrelated development, Corker and Bondera confirmed a lawsuit was filed Aug. 26 in California over deceptive consumer practices and specifically mentions the Kona coffee packaging. The lawsuit – Thurston vs. Safeway – was filed by attorney Janet Lindner Spielberg on behalf of the lone plaintiff and seeks nationwide class-action status. This lawsuit is significant because it was filed outside Hawaii, where no laws protect the Kona coffee brand. Also, it targets consumer expectations of a Kona product; previously Kona farmers have battled to safeguard their own product. By letter dated Aug. 31, 2011, Safeway Stores notified the Kona Coffee Farmers Association and Russell Kokubun, chairman of the Hawaii Department of Agriculture, that it will make requested modifications in the labeling of “Safeway Select Kona Blend” coffee sold by Safeway on the mainland. The KCFA’s Boycott resolution also noted that Safeway had for more than four months failed to respond to a letter from HDOA Chairman Russell Kokubun sent to Safeway “strongly urging voluntary compliance with our coffee labeling laws”. On Aug. 2, Safeway Director of Public Affairs & Governmental Relations Susan Houghton and other Safeway officials met with KCFA Board member Paul Uster at Safeway headquarters in Pleasanton, Calif., to review the concerns of Kona coffee growers. 2 — The Kona blend packaging will be further modified to indicate the geographical location of other beans used in the blend. Safeway has also committed to offer packages of 100% Kona coffee to Safeway customers in California, beginning next year.